An abandoned newborn baby has been discovered being 'eaten alive' by ants after being left in woodland. Police said the tot, estimated to be around three-days-old, was found by a man who heard her crying while taking a shortcut to work. She was lying on a pile of leaves and covered in ants, officers said. 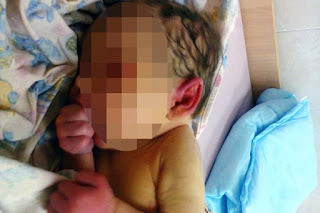 The badly bitten child was found on the outskirts of Chelyabinsk, a city in Russia. According to police , if she had not been found when she was, she most likely would not have survived much longer. The passer-by called an ambulance and the baby - who still had her umbilical cord attached - was taken to hospital. She is now expected to make a full recovery. Officers are now trying to trace the tot's parents. A police spokesman said: "The person that found the baby girl heard her crying, and on investigating discovered the child lying on a pile of leaves and covered in ants." POETRY: Spoken Word- "Who Am I"
POETRY: "What I Wasn't Taught In School"
POETRY: Spoken Word: A Deep Poem About Weed! NEWS: The Outlawz hit Vancouver June 16 for Happy Birthday Tupac Party!! Exposed: Chinese Food Place Called Asian Garden In Littleton, New Hampshire Is Filthy!